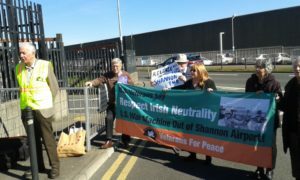 On 17th March two US Vets for Peace went into Shannon Airport to attempt to inspect US military planes suspected of carrying troops and arms. They were arrested and held, with bail being refused. The charges were trespass and damage to fencing. Their legal team initiated a High Court Action to achieve bail. A High Court hearing was heard in Cloverhill, Clondalkin, Dublin on 28th March . PANA (to which the Irish Branch of the Celtic League is affiliated) asked for supporters to attend the hearing. The Convenor and International Secretary of the CL attended. About 15 supporters came along in all. The two men, Ken Mayers (82) and Tarak Kauff (77) offered sureties of €5000 euros each and asked they be allowed to return to the US. They guaranteed they would return to Ireland for the trial. Their barrister read extracts from the US Vets Manifesto which emphasised the peaceful nature of their organisation and protests. The persecution reiterated the charges and said that the damage cause to the fencing was €2,500. Passports had been taken and they objected to bail on grounds of a flight risk ( despite the assurances given to return) . The High Court Judge after some discussion said he would not grant bail unless there was an address in Ireland for the two men. He rejected the guarantees of the two men to return if allowed home. Ex-Commandant Edward Horgan of Shannonwatch supplied an address in Limerick. The Judge granted bail for sureties of €2,500 each. The bail was paid by Ed Horgan. The men were released in Limerick in the evening. Some publicity was given to the Cloverhill High Court Hearing in the national media. Unfortunately it concentrated only on the prison conditions of the men and how they were dealt with by other prisoners and ignored totally the key issues which led to their protest at Shannon airport. These peace campaigners need our support. They deserve justice and humane treatment. We call on all branches of the CL to demand of the Irish Authorities that they allow the two men return to the US and that they stop facilitating the use of Shannon Airport by US military planes for transporting soldiers and munitions. Issued by Cathal Ó Luain, Convenor Celtic League. Image: Ed Horgan (left) briefs supporters of the two US Vets who came to Cloverhill Court. Holding the banner on left is Roger Cole, Chair of PANA and holding it in the middle is Patricia Bridson, International Secretary of the Celtic League. Does facilitating RAF Valley equate to complicity in Saudi war crimes? Our warning on marine resources was prophetic!